Some areas of the Great Lakes Region have lost nearly all of their historical wetlands, but the Great Lakes Fish and Wildlife Restoration Act (GLFWRA) has proved an "invaluable resource to organizations working to protect and restore those wetlands," says Ducks Unlimited. Last reauthorized in 2006, GLFWRA funds hundreds of Great Lakes Basin research and restoration projects, including restoring the habitats that endangered species need to survive and monitoring lake trout reproduction, adds Unlimited. But there's still work to be done. Experts at the National Wildlife Federation point out that climate change has created the need to redouble efforts to save the Great Lakes fishing heritage. Earlier this month the US House introduced a bill to reauthorize and update the GLFWRA. A companion bill calling for reauthorization of the act with amendments to address deficiencies is now sitting in the Senate Committee on Environment and Public Works. Unfortunately, securing bipartisan Congressional support for these vital efforts is a tall order in this highly polarized political climate. The need to pass these bills and secure resources for conservation and restoration is urgent. The Great Lakes wetland area "provides habitat for hundreds of wildlife species and clean water for millions of people," according to Ducks Unlimited. Restoring these wetlands would also provide "increased economic opportunities" for the region's fisherman, according to the group. Minnesota Senator Klobuchar, who introduced the the new Senate legislation reauthorizing GLFWRA is even more direct, stating in her bill that supporting sustainable fish and wildlife resources in this region is in the national interest. Help safeguard these natural treasures for future generations! Sign this petition now to urge your US Senators to reauthorize and improve the Great Lakes Fish and Wildlife Restoration Act. As an advocate for preservation of our natural environment, wildlife and clean water, I am writing to remind the Senate of the importance of the Great Lakes Fish and Wildlife Restoration Act and to urge you to reauthorize the act with by supporting S.2949. The National Wildlife Federation says the Great Lakes are the "world's largest surface freshwater ecosystem and contain 20 percent of all surface freshwater on the planet." These conservation experts note that "[m]ore than 35 million people in eight states and Canada depend on the Lakes for their drinking water" and that the lakes are home to "millions of migratory birds" and numerous fish. But "in spite of their majesty," adds NWF, "the Great Lakes are fragile and face serious threats from invasive species, toxins, water diversion, wetland destruction, sewage overflows and climate change." We already know how important the Great Lakes Fish and Wildlife Restoration Act is to some of our best natural treasures. 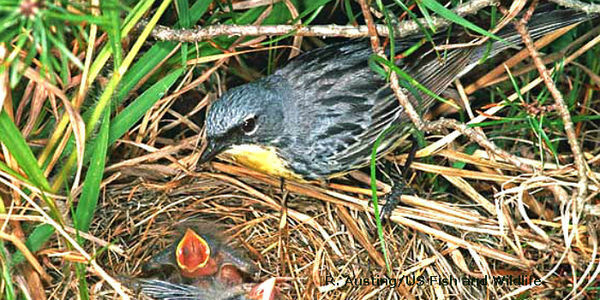 According to the US Fish and Wildlife Service, had aggressive conservation efforts not been initiated, the Kirtland's Warbler and other birds would likely be extinct by now. However, without further conservation efforts, these birds and other species face a future that is far from certain. And the experts at NWF say that because of climate change, efforts to save the Great Lakes fishing heritage must be redoubled. Now is not the time to cut funding for such vital efforts to conserve and restore species and habitats. I urge you to support S.2949 and reauthorize the Great Lakes Fish and Wildlife Restoration Act.